I spent days attempting to write this page; but unfortunately, I simply do not know enough about my father's past in the Volkswagen business. What I do know is that he has over 30 years of experience with VWs, and both my brother - Kyle - and I (who also work here at Harry Harpics) have grown up surrounded by them. Kyle even appointed a large portion of his free time restoring an old, run-down Mk2 Jetta to a vehicle he can be proud of. As for the founder of Harry Harpics, Paul Miller...all I can do is provide you with the detailed history originally written by a customer of ours in 2009 for our now outdated website. He said more than I ever could. Office Manager at Harry Harpics & Son Ltd.
Paul Miller was a professional chef before he turned his hobby into a job and became a well respected Volkswagen engine builder and mechanic. Paul always enjoyed tinkering with engines and racing cars from a young age. 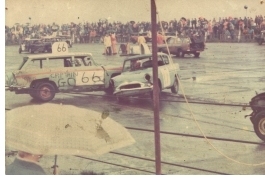 He started banger racing in the early eighties with his trusty Ford Anglia but soon found the thrills he needed were for speed and lots of it! Hanging up his Toque (Chef’s hat to you and me), Paul went to Work with Tony Royston of Microgiant in 1987. Paul says he owes a lot to Tony who passed on a wealth of invaluable knowledge to him about all things air-cooled. Whilst working at Microgiant, Tony and Paul built a 1776cc engine for Paul’s 1303S Beetle that ran in the low 15's. Then they embarked on building a modified 1600cc engine, with an FK87 cam and 48mm Dellortos. This went into Tony’s first VW and Autocross car, a highly modified bug which was known as the Prince of Darkness after it’s number plate (POD). This engine was capable of revving to a massive 10,500 rpm with mostly stock parts!! Paul won a 1st place trophy in the Super Street Class and became Modified VW Engine champion in 1990 and to prove it wasn't a fluke, he won it again in 1991. His personal best being a 13.018 second run @100mph. Paul established Harry Harpics in 1993 and through word of mouth alone has been going ever since! His reputation as an honest and reliable mechanic and engine builder has brought him regular customers from all over Britain and even as far a field as the continent. He has worked on hundreds of cars and many well known Buses, including Rikki James’s awesome '54 Barn-door Samba. Paul has done extensive work on Rikki’s Samba and am other things, has installed a 2.6 litre Type 4 engine, narrowed beam, disc brakes all round and a Porsche 915 5-speed gear box. He is so well known within the VW community for his IRS (independent rear suspension) conversions that it is often used as a selling point. A “Harry Harpics IRS conversion” in your advert can add £££’s to your vehicle’s value. He has done over 60 in house conversions for Buses, Beetles and Karmann Ghias as well as supplying quality DIY kits for many more customers. Engines and horsepower is where Paul really excels though. He has built many engines over the years that have gone into show winning and magazine centerfold cars. Dedications to his work are often found in magazines such as Volksworld, Ultra VW etc. At present a Beetle running a 2180cc Harry Harpics engine is running in the 11’s on the strip and a Buggy (pictured above) running a 1776cc HH engine recently ran a 13.6 at the 1st European Bug In, in June 2007. Another HH 2180cc powered 1970 Beetle, on a track day event in 2007, reportedly took down several Porsche 911’s and 928’s as well as a BMW 3 series! Also, one of his regular customers is claiming to have got 130mph out of his 1303 bug with an HH 1776cc engine in! Enough said I think. Currently Paul owns a 1965 beetle shown above and until recently, one very cool, ex military, hoodride ambulance. Paul has just fitted a turbo engine to the beetle (December 09), that he of course built himself. The bus, which he has just sold, was a '64 ambulance which had a Porsche 944 IRS set up with a 1600s gearbox, 944 discs up front, genuine Fuchs wheels and a type 4 engine with twin 44 webers! I’ll leave the last word with Paul which is what he said to me the first time I met him. I’d just had a few bad experiences with some other so called VW expert mechanics and needed some work done on my 1969 Karmann Ghia. I haven’t been anywhere else since.